The year 1998 was truly purple for Sachin Tendulkar: a record 1894 runs at an average of 65.31, with nine hundreds and a truly ahead-of-the-times strike rate of 102.15. It turned out to be his best bowling year too: 24 wickets at 26.5, a match-winning five-for among them. But he had started the year struggling in ODIs, not having scored a century in 33 innings. He ended that drought ten days before the start of the annual Sharjah Cup, which that year featured India, Australia and New Zealand. Australia had just beaten India in a tri-series, and looked set to extend that streak with three wins out of three in the league phase in Sharjah. Their final league game, against India, was all but a warm-up for the final, two days later, a potential clash against New Zealand on the eve of ANZAC Day. India, on the other hand, needed to win, or at least lose narrowly to Australia and sneak ahead of New Zealand on a better net run rate if they entertained hopes of qualifying for the final. Tendulkar: Sharjah in April was extremely hot and unrelenting. I remember going back to the dressing room and asking for a bucket of ice and dipping my feet in because it was bad out there. It was so hot you could feel the heat steaming through your shoes. I could feel the soles of my feet become soft and tender due to the friction, as I had run quite a bit. It was physically draining to bat for long hours, and with little recovery time between games, it was a stern test of a player's skill, both physical and mental. Ajit Agarkar, India fast bowler: It's funny, actually. The series before this was my debut, where we played Australia and Zimbabwe. We won all four league games but lost the final to Australia, in Delhi. We went to Sharjah, beat New Zealand, lost the next two games, and because we'd beaten New Zealand once, we just about had an outside chance to qualify [for the final]. Ian Chappell, television commentator at the series: One-day tournaments usually don't stick in the mind too well. The first thing I remember about this one is that Mark Mascarenhas [of WorldTel], who had the [television] rights in those days [and who had started managing Tendulkar], asked me, "Who's gonna be in the final?" And I said, "ANZAC Day, mate. New Zealand versus Australia in the final." And he turned to Greg [Chappell] and said, "What do you think?" Greg said exactly the same, and Mark then made some comment about, "Tendulkar will get 'em home, you see." Hrishikesh Kanitkar, India allrounder: Till then, I'd seen such big tournaments in Sharjah only on TV. I'd seen so many matches played by India against Pakistan in Sharjah, and to play myself was super-exciting. 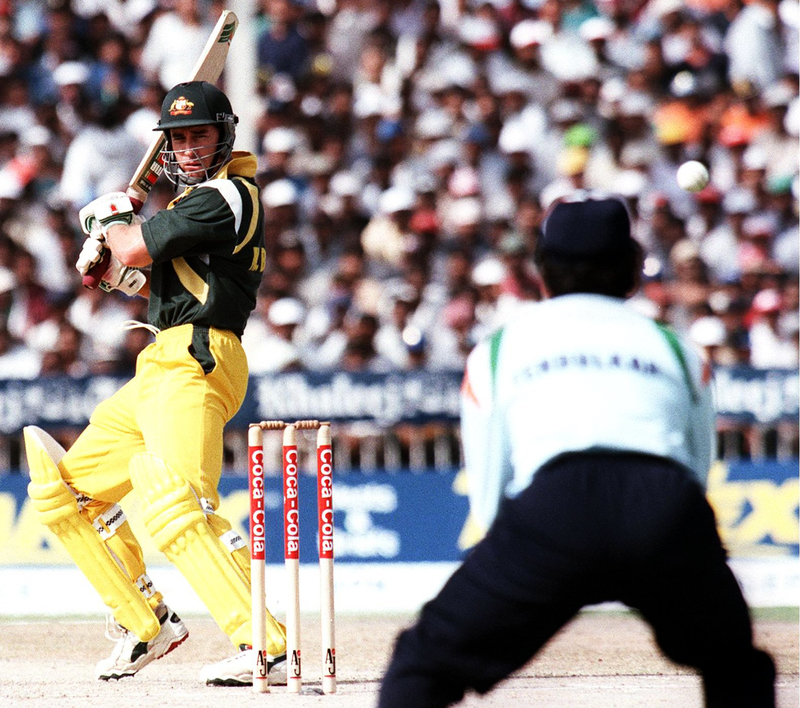 India lost the toss and were treated to a sublime Mark Waugh 81 and a Michael Bevan hundred. At one point Australia threatened to run away with it, but Tendulkar, bowling accurate legbreaks, made two vital contributions. Tendulkar: I was a regular bowler at this point of time in my career, and I was successful in making such breakthroughs on a number of occasions. Mark Waugh was trying to hit against my legbreak and top edged. As for Steve Waugh, I ran him out. I made sure no one took a chance with my arm! Those two wickets were critical because Australia were going great guns. They could have crossed 300. Chasing 285 to win and 237 to qualify on net run rate, India lost Sourav Ganguly early, trapped in front by Damien Fleming, the most successful bowler in the tournament. Agarkar: Australia were a good team even without [Glenn] McGrath in the side. They had Warnie, [Michael] Kasprowicz and Fleming, with the Waughs bowling a bit. Looking back, 284 was a massive total, and you had to do something out of the ordinary to chase that kind of score down. Nayan Mongia, India wicketkeeper: When I finished keeping and went back to the dressing room, I was told to pad up and go at No. 3 as a pinch-hitter. It could have been because I was playing fast bowling well and the fact that I'd done it in the past as well. We were chasing a big total and needed to get there quickly to qualify. Nobody [in the Aussie camp] would have thought that I'd come out to bat at three. Kanitkar: Everyone expected things from Sachin all the time. It was the same during this tournament too, and we were all prepared to do whatever it took to reach the final. Tendulkar: Anshuman Gaekwad [Indian manager], Azhar [Mohammad Azharuddin, India captain] and myself as vice-captain took that call to push Mongia up the order. The idea was we should get off to a good start and score some quick runs upfront. That was the period when pinch-hitters had become a trend. In the Titan Cup, played in India [in 1996], where I was the captain, I used to send different batsmen as pinch-hitters, including the likes of Javagal Srinath against South Africa in Rajkot. The whole idea was to take the opposition by surprise, and it worked some times, like it did against Australia in Sharjah. Mongia played his role, hitting out against the seamers, even taking on Warne briefly. What followed, though, was a familiar Indian middle-order collapse. With 21 overs left, India were four down, needing 156 runs, when a sandstorm sent players and umpires scurrying for cover. Tendulkar: I had never seen a sandstorm in my life. It was like being in a Hollywood movie. I was all set to grab hold of [Adam] Gilchrist, who was next to me. I thought, if I am going to be blown away, I should at least get hold of someone who is 80-90kg! I did not know how to react to it. Players were lying flat on the ground. Chappell: Literally the first thing I remember about this tournament is the sandstorm. I've never seen a sandstorm before or since in my entire life. The way Tendulkar was going, it felt like the sandstorm was about the only thing that could stop him that night. When play resumed after about 25 minutes, it was a truncated 46-over game, and India's equation was clear: get 94 off the next 15 overs to qualify, or 133 off the same number of overs to win. Tendulkar: The revised target was discussed in the dressing room with Anshuman Gaekwad and Raj Singh Dungarpur [former BCCI president and selection-committee chairman at the time]. We were told the target we needed to qualify for the final, and what we needed to get to win the game. In my mind I was thinking of winning the game. I was not looking at just qualifying, because beating Australia in the match and then meeting them in the final would have given us the psychological advantage. I wanted to win it. Damien Fleming, Australia fast bowler: Just over a month before Sharjah, Sachin had failed in a game in Cochin, but then he went on to get five wickets and win the Man-of-the- Match award. This guy is superhuman. It was a weird series - the ODI series in Sharjah. We must have faced each other seven or eight times because we had a measure of every Indian batsman by then. They had some great ones - Sourav Ganguly, Navjot Sidhu, Ajay Jadeja, a handy ODI player, and Azhar [Mohammad Azharuddin]. We had them under control. I felt we were on top of Sachin, and then we had a sandstorm and he came out and decided, "I have to start taking this away", and he did! Tendulkar went after each one of Australia's bowlers when play resumed: Warne, Tom Moody and Kasprowicz. While he hit boundaries with incredible shots, he also ran like a man possessed, pinching twos at every possible opportunity. His partner, VVS Laxman, did a good job of giving Tendulkar as much of the strike as possible, and with a little over seven overs to go, the equation was reduced to less than a run a ball. Laxman: I came in to bat at 138 for 4, and out of the 112 runs that were scored after my arrival, I made only 23. His 143 was one of the most dominating knocks I have seen by an Indian batsman. That was the first time I saw someone in the zone. I was talking to him between overs, but I know he wasn't listening to me. Tendulkar: The entire series I was batting well. I was in superb nick and really, really confident of winning matches. Before we went to Sharjah I had scored runs in both the Test series and ODI series [against Australia]. They were doing their best to keep me off strike, while my partner VVS Laxman was doing his best to make sure I faced the bulk of the bowling. Looking back, I feel I owe him an apology, as at one point I lost my temper with him when he refused a second run, thinking I was in danger of getting run out. I just wanted to play every ball I could. Chappell: When Sachin really started to go, I remember saying to Mark [Mascarenhas], "He's not looking to qualify. He's trying to win the game, and he's only interested in getting enough runs to beat Australia." Kanitkar: He didn't try any fancy things or improvisation. He played proper cricketing shots. If the IPL had been around back then, what would Sachin have done with that kind of hitting? For those who watched the game that day on TV or later on YouTube and elsewhere, the one thing that sticks in the memory, apart from Tendulkar's innings, is the voice of the late Tony Greig on commentary, adding theatre to the proceedings. Beautifully played, that now really does take the pressure off them. They are dancing in the aisles in Sharjah. Straight down the ground, wonderful shot, all the way for six. Whaadaplaaya. With India needing 18 off 29 to qualify, Tendulkar pulled Steve Waugh to the midwicket boundary, where Damien Martyn ran to take the catch. Here's Greig calling the drama that followed. It's gone again, it's all the waaay out, it's gonna be caught. Oh he's got him! Tendulkar's out. Oh he's dropped him, he's dropped him! It's gone over the fence for four. Well, that is it, I'm sure now [that India are going to the final]. Tendulkar was eventually out for 143 off 131 balls, but by then India were through to the final on net run rate. Tendulkar had attempted to hook a short delivery from Fleming, who jumped up immediately appealing for a caught-behind. The umpire took his time to make a call. Tendulkar I got bad decisions in both those matches on April 22 and 24. In the desert-storm match, I never walked, as is the popular opinion. When the square-leg umpire signalled I was out, that was when I started walking. Chappell: The only thing I noticed was that whenever Sachin got out, Mark [Mascarenhas] usually got up and went back to the hotel. Obviously when he was a young guy living in India, he was interested in cricket, and then he went and lived in Connecticut for 20-odd years. But he saw a Sachin innings somewhere on television and that's what revived his interest in cricket. He was much more a Tendulkar fan than an Indian cricket fan. Tendulkar: When we returned to the hotel after the game, I was very tired and yet I just couldn't get to sleep. I eventually dropped off well after 2am. With just a day before the final, this didn't bode well. In the extreme heat, I had lost a lot of fluid and I needed time to get myself rehydrated and allow my body and mind to recover. When I got up in the morning, my body was stiff. My back was tight and I was even finding it difficult to walk to the bathroom. April 23, 1998. The day before the final. Also the day before Tendulkar's 25th birthday. Mascarenhas threw a party at his hotel, inviting players from both sides, commentators and journalists. Allan Border, Australia's caretaker manager at the time, said to the Chappells, and some members of his side, that there was no way Tendulkar could better the 143 in the final. Chappell: Well, I wouldn't be making those sorts of predictions against the best of players. They have a habit of proving you wrong. The thing I recall from that party was about Coca-Cola, who had a huge ongoing rivalry with Pepsi [a brand Tendulkar endorsed] and were sponsoring that tournament. In the middle of the party, the Coca-Cola boss said to Mark [Mascarenhas], "If Sachin gets a hundred in the final, I'll give him a Mercedes". Kanitkar: We had just one day between that late-night finish and the final. After how Sachin played in that final league game, the mood was upbeat, we were all happy and confident going into the final. On such days it doesn't strike you that you have 100 more overs of international cricket to play within a day's gap, and it doesn't affect you. Agarkar: I was still carrying the injury but I had to play the final. The night before the final, Sachin and I were having dinner. The Sharjah wicket was a flat one, and we knew we had to try something unconventional to get at least one of Mark Waugh and Adam Gilchrist out early. Back then, bouncers were not allowed in ODI cricket, and while it would be signalled a wide or a no-ball, bowlers still used them to line up the batsmen. Over dinner, Sachin said, "Look, I know it is a no-ball, but let's bowl one or two [bouncers] to him and try to get one wide." Mark Waugh pulled my first short one to get a couple of runs or something. The next ball was really wide and he nicked it. It wasn't the greatest of balls to get him out, but it was one of those things we had thought of and worked. 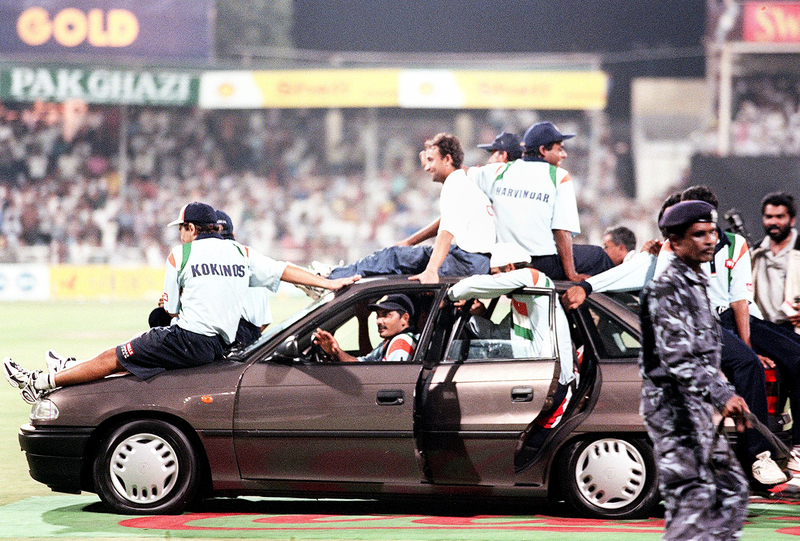 While India got Mark Waugh out early, the final turned into a near replica of the last league game. Australia put up 272, powered by fifties from Steve Waugh and Darren Lehmann. This time, India had no revised target to chase. Get 272 and take the trophy or go back home having lost a second consecutive final to the Aussies. Agarkar: While chasing, the perception that we were dependent on Sachin was probably true. If Sachin had gotten out, sandstorm or otherwise, I don't think we'd have got the runs we needed to that [earlier] night. It was an era where Indian teams didn't chase well and always felt under pressure. The belief suddenly went down. Sure, you won a few games, but the belief dropped quite a bit after that. Mongia: We needed a good start to chase down that total in the final, and it felt good to take some of that pressure off Sachin after Sourav's dismissal. Those were two of the few good knocks I played at No. 3. Both Tendulkar and Mongia were severe on Warne, another man at the peak of his powers. On that night, though, he ended up with 0 for 61 from ten overs, his most expensive wicketless spell in ODIs at that point. Chappell: It was always good to watch the two of them [Tendulkar and Warne] go at each other. The knock that really sticks in my mind was the one in Chennai, when the game was evenly poised. Warne went around the wicket and Sachin took to him. Shane had to go back over the wicket, Tendulkar got 150 [155 not out], and India won the match. It's pretty rare that you get two players of that calibre playing against each other at their peak. It doesn't happen all that often, so you really savour it when that happens. Mongia: Sachin told us in the dressing room that we'll get the runs, win the game and finish it off. He's always had that special affinity for the Australians, and the wickets are mostly flat in Sharjah. Maybe it turns a bit sometimes, but we've always handled spin very well. He was relatively subdued when I was taking charge, but once I got out, he took charge. Whenever he stayed 50 overs, wherever India played, whichever team he played for, that side would win. Tendulkar found a steady partner in Azharuddin and they put on a tournament-winning 120 at a run a ball. Tendulkar was depositing balls on the roof of the stadium, and Greig was going ballistic ("If you're at the far end of the ground, get ready to catch them in the crowd") and only a dubious leg-before decision got rid of Tendulkar. By then, the game was all but over, with India needing 25 off 33 balls. Kanitkar: Just when we thought we wouldn't get to bat, I had to go out with 12 needed off the last three overs. These sorts of situations put more pressure on you than chasing 20 runs off two overs, where you can hit out with a clear mind. I had to make sure we finished that game and that I shouldn't leave it to anyone else. Thankfully, I hit a boundary through covers to win the series. Agarkar: It was a huge moment in my career, just to win a trophy. In my debut series, we'd lost the final. When you had played Australia, you realised how tough it was to beat them. Winning a tournament against them was great fun and gave youngsters like me a bit more belief and confidence. Not that we beat them a lot after that - we struggled on subsequent tours and at the next two World Cups - and that made these victories stand out a lot more. A record 24,000 people turned out for the final, the highest ever in Sharjah at that point. 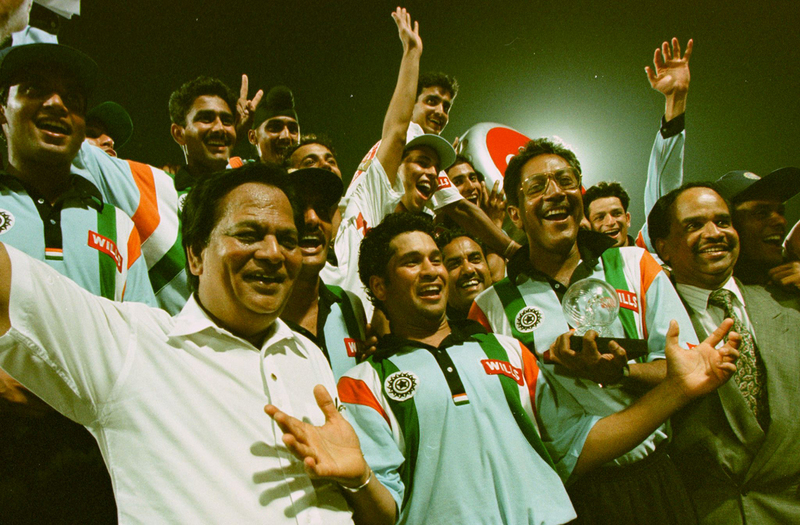 With crowd favourites Pakistan not in the tournament that year, the crowds cheered for India through those two nights, and it all hit fever pitch when Tendulkar was batting. Fleming: I do remember the final, because I share a birthday with Sachin. I said, "Happy Birthday", and whatever that stadium holds - 25,000 - [went up for] a massive cheer. Right in the end, he has got a century, we are going to lose the game, they put up a "Happy birthday Fleming!" poster. Nothing like 25,000 boos on your birthday and losing an ODI final to make you feel at home! I don't know if Sachin has spoken about that period, but I thought he was at his peak. And he had a long peak. Chappell: The crowds were always big whenever and wherever India played. The biggest crowds were obviously during India-Pakistan games. Much as they do when [Virat] Kohli comes in to bat now, the atmosphere changed when Tendulkar came in to bat. You could feel the excitement in the crowd. That was a normal thing whenever Sachin played, whenever India played. Tendulkar ended up getting his 31st international hundred on his 25th birthday, riding away in an Opel Astra as the unanimous choice for the Player of the Tournament. Coca-Cola kept their end of the deal, presenting him a Mercedes SL600 for his hundred. Tendulkar: I was soaked in sweat and, seeing Mark [Mascarenhas] was about to give me a hug, I remember warning him that he would spoil his smart clothes. Mark wasn't bothered and he lifted me up into the air with a smile. The post-match presentation turned out to be really special. Steve Waugh said that they had lost to me, which was quite something coming from the Australian captain on a day which also happened to be my 25th birthday. There could have been no better birthday present. Former Australia legend Richie Benaud, who was commentating during the tournament, called Tendulkar's twin centuries "two of the greatest" innings he had witnessed. Tendulkar: I met Mr Benaud over lunch the next day and he praised my innings. I felt special and humbled. He also had good words about my legspinners. What an incredible experience it was. That was one period where Australians travelled across the world and thrashed everyone. They were by far the best side in the world, and to go out and chase 270-odd was a big ask, but we were able to do it. When I got back, the kind of reception that I received - I remember, yesterday I was talking to one of my friends and we were talking about a single-wicket tournament in Shivaji Park where I was the chief guest the next day [after the Sharjah final]. Shivaji Park was completely crowded with cricket fans and that left an impression on me, and it was all due to Sharjah.